Love McManus. Have for years. My 11 YO grandson loves hunting and fishing, so am looking for a good McManus book to start him out on. Found your site so am signing up for the newsletter. love everything he writes but can’ yet locate “Mountain goats never say cheese” read in a Reader’s Digest long ago. can you help? put me out of my misery ! Barbara, the story “Mountain Goats Never Say “Cheese!”” is found in the book A Fine And Pleasant Misery. Anyone know which one is about the boy that plays hookie and goes ic fishing? Linda, that story is titled “A Big Chill” and is found in the book The Bear in the Attic. whats the one about a guy working on a roof while attached to a car bumper via a rope? Hi Kurt, I don’t remember that particular story. 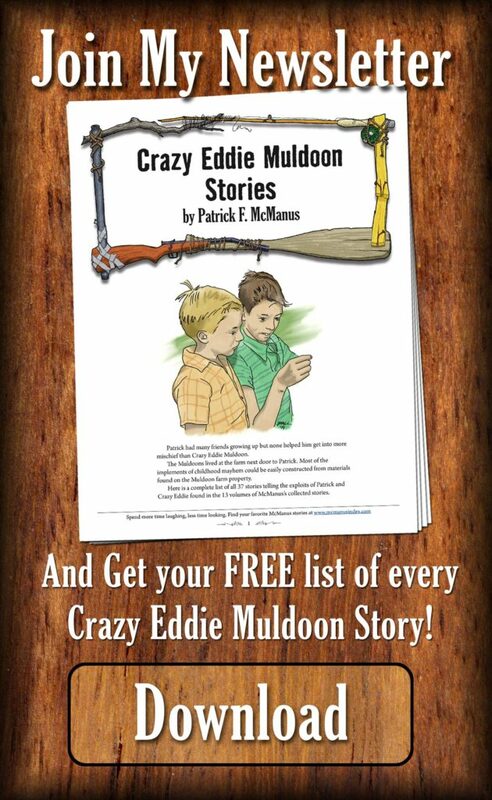 There is one where Pat and Crazy Eddie Muldoon lasso a horse and it drags Mr. Muldoon around the farm (the rope was tied around his waist because he was doing roof repairs on their barn). That story is titled “Real Ponies Don’t Go Oink!” and is in the book of the same name. Did the elk hunting story where Pat and his buddy quarrel over who gets the best steaks and roasts but later in the year try to push the remaining elk meat packages off on each other ever make it into a book? I once met Pat and the guy that performed his books and the swore it was. Then they looked through every index and confessed it was not but promised to get it in the next one. Yes, actually it is in the book Never Sniff a Gift Fish. It’s titled “Share and Share Alike.” Patrick told me that my index had helped him find stories he couldn’t remember having written, let alone which books they were in. Glad I could help! Previous Previous post: The Horse in My Garage is Finally Here!